Basically, a proxy server is another computer which acts as an intermediary between client (e.g. your computer) and the remote server, which client is accessing to. Using a proxy server, your computer sends requests to the proxy server instead of the desired destination, proxy server processes your request and returns what you were wanting. Why do i need a proxy server? Proxy servers are used for a number of reasons such as to go around various online restrictions, like a content blocking, request limit and more, and to provide anonymous browsing. The reasons to use a proxy server can be a lot, consider the most common of them. Anonymous access to Internet resources. High anonymous, Anonymous and Distorting proxy servers allow to access different network resources anonymously, including web surfing, email sending, playing online games or communicating with instant messengers, without revealing your real IP address. Checking resource availability from around the world. Using proxy servers from different countries, you can perform an availability test of your Internet site from different locations (ISP, networks etc.) to diagnose network connectivity problems. Speed up network resources access. The proxy server may speed up your access to some Internet resource due to its caching mechanism (if someone has requested this resource earlier) and/or its fast connection speed and physical closeness to the requested resource. Bypass online blocks. 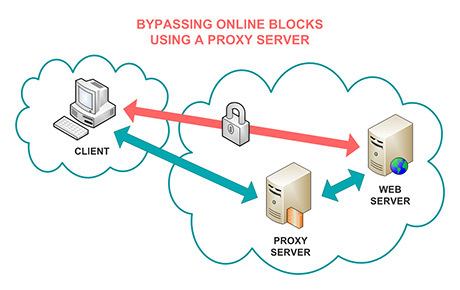 Using a proxy server, it is possible to gain access to the resource that you cannot access directly for any reason, such as if your IP banned on the remote server, if requested resource is blocked by your ISP or network administrator, or due to networking connectivity problems. What is a cascading proxy server? If you're using an anonymous proxy to access some resource, this resource will determine proxy IP as a remote client address, instead of yours. And often, proxy connection IP address is the same, as an outbound IP, determined by a resource, accessed through the proxy. Cascading proxy acts as a middle man between the real proxy server and your computer, so its connection and outbound IP's are different. One cascading proxy server can serve multiple ports, connection to each of them will result a connection to the real proxy server with different outbound IP, which may be even from different countries.